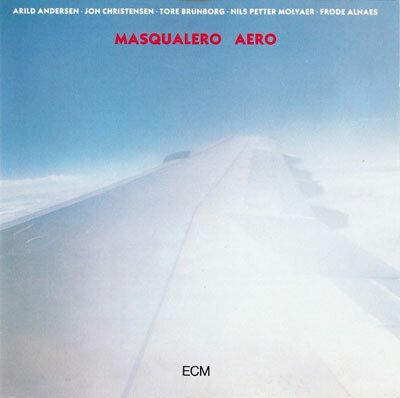 "Arild Andersen found one of his clearest avenues of expression with Masqualero, a group that brought him notably together with trumpeter Nils Petter Molvær, saxophonist Tore Brunborg, and drummer Jon Christensen. On Aero, the group’s second album for ECM, he is joined also by Frode Alnæs, whose looming drones ebb and flow throughout the title opener, which seems to materialize out of nothing into a looming figure of delicate comportment and elegant mind. It is this figure whose footsteps Andersen articulates. In “Science” this figure shows us it can dance, fashioning a partner out of snatches of rain and cloud, autumn and snowdrift. The confidence of that stride is expressed in the superb dynamic contrasts of the band, only to be unraveled through Brunborg’s platonic soprano into a sonorous vulnerability. Despite his penchant for lush enigmas, Alnæs isn’t above flicking a brief allusion here to “Flight of the Bumblebee” from the end of his sonic cigarette. Andersen opens “Venise” alone before smoothing out its wrinkles through Christensen’s delicate shaker and gurgling snare. Molvær is beguiling here, all the more so for being backed by the ghostly draws of Alnæs’s electric. “Printer” busts out a decidedly fatter sound, marked in the shift to alto sax. Guitar lines scratch the earth with their steel-stringed nails, Andersen licking the background like a flame all the while. “Bålet” opens in a quiet electronic swamp that sounds more like something off of Jon Hassell’s Power Spot, which is to say it comes across as highly organic in spite of the technological enhancements. Alnæs floats some lanterns from the book of Rypdal on the icy stream that is “Return,” which is kept from freezing over by Andersen’s buoyancy, and resolves into an eddy of brass. We come at last to “Bee Gee.” Molvær’s muted wings balance Andersen’s deep twangs, threaded by a fragile shaker. The loveliness intensifies with Brunborg’s soprano and in the lilting crawl of the guitar, which carries us out in heavenly repose."